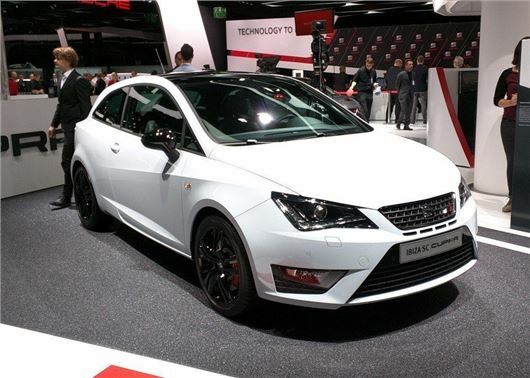 SEAT has revealed the most powerful production Ibiza Cupra ever at the Frankfurt Motor Show 2015. The revised Cupra gets a turbocharged 1.8-litre petrol engine is capable of covering 0-62mph in 6.7 seconds. It'll reach showrooms in January 2016. As well as getting a bigger engine - it previously used a 1.4-litre - the Ibiza Cupra gets more torque and a six-speed manual gearbox as standard. The engine is the same powerplant found in the Volkswagen Polo GTI, which producs 192PS and 320Nm of torque, almost 100Nm more than the old Ibiza Cupra. The power boost provides a Ford Fiesta ST rivalling top speed of 146mph, with power delivered to the front wheels via a six-speed manual gearbox. Adjustable damping is also fitted as standard, allowing the driver to customise the handling characteristics with SEAT's user-friendly Cupra Drive Profile system. Other upgrades include larger brakes and a new bodykit, with new 17-inch wheels, LED lights, rear diffuser and new central rear exhaust. The cabin gets more tech too, with MirrorLink connectivity that will allow an Apple iPhone or Android phone be accesses via the in-car touchscreen.